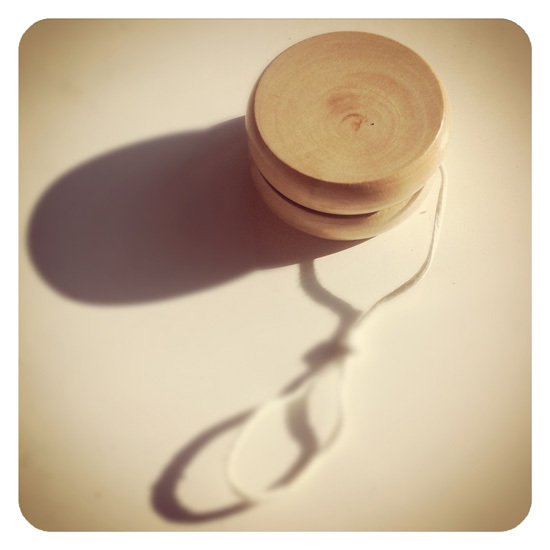 Like so many traditional toys, the yo-yo has been popular across cultures for the last 2500 years. It’s had a great history, with a tremendous burgeoning in popularity in the 1920’s and 1960’s, and still it persists. Like jacks and jump-rope, the yo-yo is not as easy as it looks. My own skills are quite sorry in this regard. Fortunately my smallest child has agreed to show us how it’s done. So, I think the idea is that the moment it touches down, you lift a little bit to encourage it to wind back up. I’ll keep practicing. Maybe one day I’ll be able to do the sleeper, or walk the dog. After a long search I’ve settled on a good toothbrush. 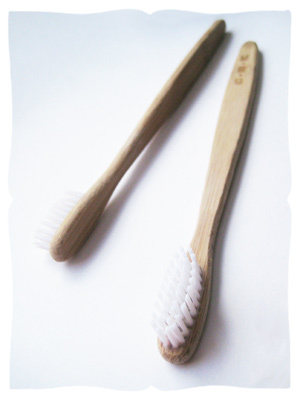 We’ve tried wooden ones with natural bristles; awkwardly shaped. We’ve tried plastic toothbrushes with removable heads and natural bristles; the bristles fell out. We’ve tried another removable-top version with plastic bristles; still so much plastic. Then I came across another possibility. These are bamboo handled toothbrushes, quite beautiful I think. They’re shaped well, and don’t seem to turn grey in the water as wood does. Even the bristles are a biodegradable nylon, so they are compostable. A fair companion to our homemade toothpaste. They age well too, and so they’ll be retired in a few months to the cleaning trug, to live out life in service, in the company of the feather duster, the cotton mop, the sodium bicarbonate and the vinegar. Have a look around for bamboo toothbrushes, see what you think. Like a set of wooden drawing pencils, or an ink-filled fountain pen, I adore tailor’s chalk for its simplicity of form. 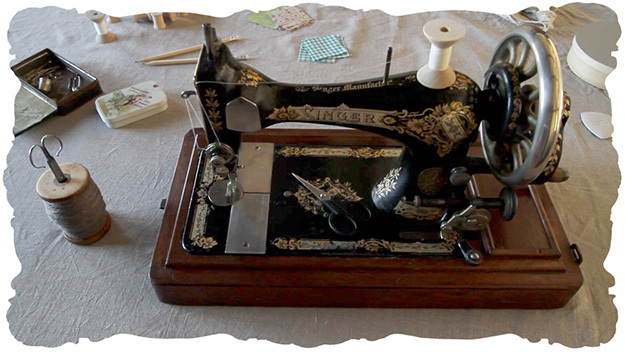 Just a flat shape to grip, a sharp edge to mark fabric with, a pure substance that harms neither the cloth nor the tailor. I have great respect for the ecology of a product that leaves nothing to throw away when it’s done. Even a broken piece remains useful. I love to use this chalk for measuring and marking in quilting and dressmaking. And isn’t it a pretty object? One of the traditional skills I’ve been studying is quite compatible with a predilection for fixing up old furniture. The fine art of haggling. I once read that if the seller doesn’t bargain, they always feel they should’ve asked for more, and if the buyer doesn’t bargain, they always feel they should’ve paid less; when they both negotiate, everyone goes away feeling quite satisfied with themselves. At any rate, between antique shops, online auctions and vintage markets, I’m in training. Just recently I bargained my way into a great deal on a neglected old painted secretary desk. 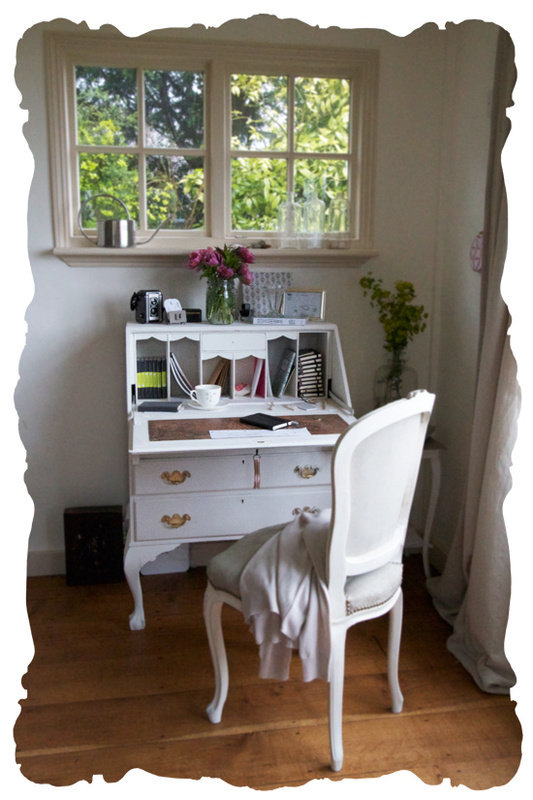 The writing desk came home with us, to be refinished like several pieces I’ve worked on at the old cottage. The yellowed paint was sanded a little and lightly coated with Old White chalk paint, and I removed old paint from the ornate handles with a dull scouring pad; they came up beautifully, though I admired some of the texture and left it. The good old fashioned leather inlay needed a gentle scrubbing and oiling to restore, it’s a beautiful surface to write upon with just a sheet of paper, though I’m usually working in a sketchbook or writing book. My fountain pen will be a natural match for the piece, when it returns from Germany where it is kindly being repaired, as I had the ill fortune to drop the lovely thing and crack it. Now the desk needs a coat of wax to protect its surface, but I’ve been too impatient to use it! I adore this bit of furniture, I am thrilled to find it is such a well considered design. All of the drawers lock with a charming key, along with the desk that opens and shuts so elegantly. I love that I can lock up my work for the night, put it away, finished. I’m so pleased to have a devoted place for writing, with drawers and cubbies to keep all manner of papers and objects that didn’t have a good home before. My laptop fits it well, and having a dedicated place to work on it means that I don’t feel I am always working, and that work is everywhere. The top of the desk is just right for a collection of inspiring objects to gaze at, though I can see a bookshelf would also fit beautifully, and the leather inlay has clearly been used just as much for cups of tea as for writing. Ideal companions. If I could persuade my tall child to share, I think her typewriter would look debonair on it. My first experiment in painting fabric, an upholstered chair, had one more coat of a linen shade and is the perfect fellow to the desk, pretty, comfortable and ergonomic no less. When not in use the bureau looks dashing in the corner, which I consider an achievement for a workspace. Secretaire. Well made. read more tried & trues. 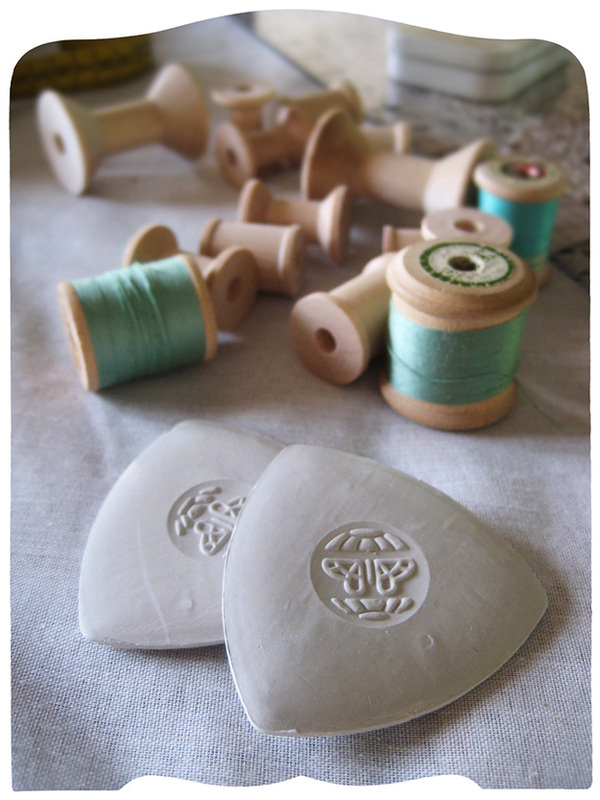 read more stories about handcrafted things. Essential to any garden is a good watering can. Naturally. Like my collection of galvanised buckets, I prefer metal watering cans for their ability to endure wet winters and bright summers. Weathering them just develops their character. They should last well beyond my lifetime, and do it beautifully, a pair of requirements I like to use before purchasing anything these days. My sweet family gave me a great tankard of a watering can for Mothering Sunday our first year in London. Good choice, particularly as we had to carry water from the kitchen upstairs, through the living room, out the french doors, up the steps and down the long narrow garden. A rainbarrel made that task easier later on. I keep this one in the cottage’s greenhouse now, to care for the winter cut-and-come-again lettuces that have sprouted a rich spring green. 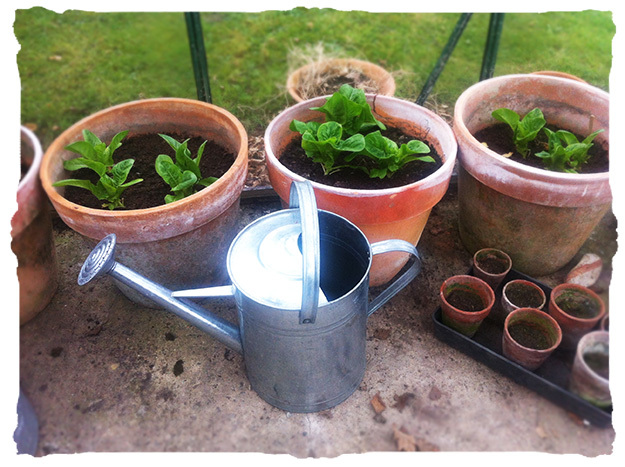 I do prefer my homemade thumb-sprinkler for the seedlings, but these strong lettuces need a good soaking. 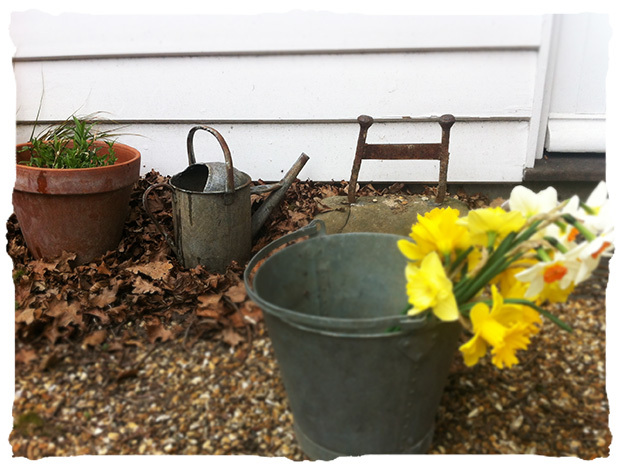 The term “watering can” first appeared in 1692, in the diary of keen cottage gardener Lord Timothy George of Cornwall. Before then, it was known as a “watering pot”. In 1885 the “Haws” watering can was patented by Michael Deas. He replaced the top mounted handle with a single round handle at the rear.